Having shopped for a tablecloth recently, I can tell you that they’re REALLY expensive, especially if you have a long table to cover up. Even making one yourself can get expensive, as they take a lot of yardage. Becky from Patchwork Posse has a solution. 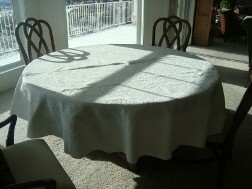 She shows how to make a tablecloth from a repurposed bedspread (not a puffy one!) or another tablecloth that is too large. Brilliant! Get the how-to. Tablecloth alternatives are great. I recently found a never-used chintz shower curtain in a thrift store – fabulous cottage print. I was going to cut it up to make tote bags, but once I realized it fit my dining room table perfectly, it’s never made it to the sewing room!